Happy Dayz Hosta is a sport of the Orange Marmalade. As the leaves grow throughout the summer, the green to blue green outer edges widen as the bright yellow centers mellow to a creamy white/yellow. The foliage offers a rough texture that deepens as the plant ages. 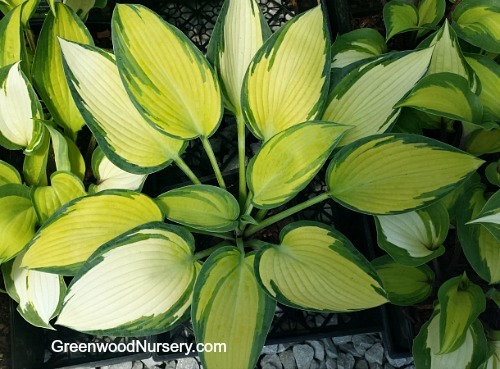 Brighten woodland settings with the Happy Dayz Hosta. Orders shipping to AZ or CA will be bare rooted and root washed before being prepped for shipping.